Washington Redskins cornerback Quinton Dunbar (47) reaches to block a pass intended for San Francisco 49ers wide receiver Pierre Garcon (15) during the second half of an NFL football game in Landover, Md. LANDOVER, Md. — The 49ers were going to break their streak. They were going to win a game. All they needed to do was get into position for a Robbie Gould field goal. But then, disaster. On 2nd-and-10 from the Washington 40-yard line, C.J. Beathard was trying to find Pierre Garcon on a short route. The pass fell incomplete and a flag flew. 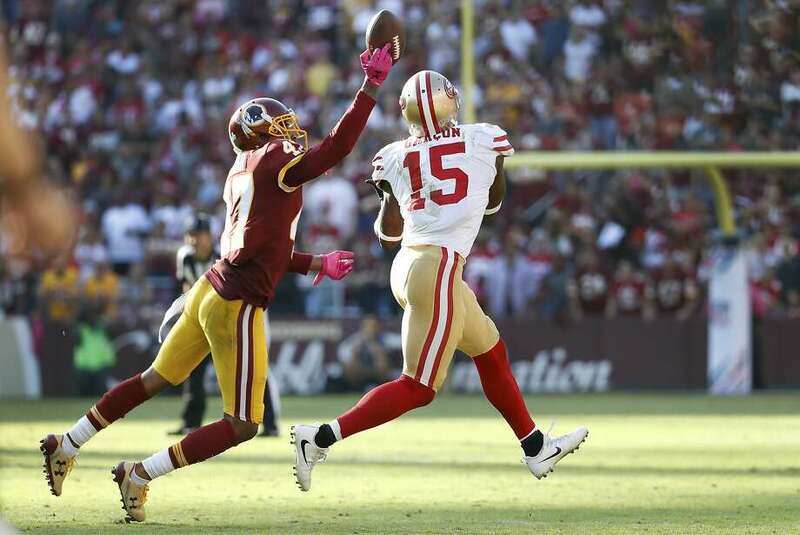 Instead, it was bad news for the 49ers: an offensive pass-interference call on Garcon. Garcon was clearly furious on the field, but the 10-year veteran didn’t extend his feud into the locker room. “One call does not win us or lose us the game,” he said. Garcon, in a return to the team for which he played for five seasons, did as much as he could to win the game. He was targeted 12 times and caught five balls for 55 yards. Also on the final drive, two snaps before the disputed call, Garcon made a heads-up play that helped keep the 49ers alive. Washington cornerback Quinton Dunbar knocked away a pass intended for Garcon, but Garcon leapt to grab it out of the air and came down inbounds. After first calling the pass incomplete, officials reviewed the call and reversed the initial ruling. That gave the 49ers a 1st-and-10 on the Washington 40. And then came the controversial call, on which two players appeared to run into each other. “I saw a slant route on a flat route and the guy guarding the flat route ran into a guy,” 49ers head coach Kyle Shanahan said. The breaks aren’t going the way of the 49ers. Neither are the calls. Nor are the wins. 1st-and-10: Beathard throws 22-yard pass to Pierre Garcon. 1st-and-10 at S.F. 42 (47 seconds left): Beathard throws 6-yard pass to Carlos Hyde. 2nd-and-4 at S.F. 48 (:41): Beathard throws incomplete to Trent Taylor. 3rd-and-4 (:36): Beathard throws 12-yard pass (at left) to Garcon after replay officials overturn on-field call of incomplete. 1st-and-10 at Washington 40 (:28): Beathard throws incomplete to Garcon. 2nd-and-10 (:23): Garcon called for offensive pass interference. 2nd-and-20 at 50 (:19): Beathard throws incomplete to Hyde. 3rd-and-20 (:14): Beathard throws incomplete to Garcon. 4th-and-20 (:09): Beathard pass for Greg Kittle intercepted by Kendall Fuller.